You are here: Home / Guitar Accessories / Effects Pedals / The Best Distortion Pedal. Really? The Best Distortion Pedal. Really? I’m going to spill the beans right away here… Is there really such a thing as the best distortion pedal? Well, the short answer is NO. The long answer would be: There are a number of VERY good, if not incredibly awesome distortion pedals out there. Ever since the first distortion boxes where invented (we’re talking about the early fuzz boxes; the stuff made AFTER guitarists started liking the sound of overdriven amps and speakers) guitarists have been going mad making new ones & modifying old ones. The fact is that what today is the perfect tone for somebody, a few weeks, months or years later that same person might want something different. For this very reason, and the fact that the distortion pedal is one of the most important effects in any guitar pedal board, there are more distortion pedal models that any other type of effects pedal. Hands down. Not every company makes a pitch-shifter or an analog delay unit. But I could risk myself and suggest that every single serious guitar effects company out there has made a distortion pedal at some point. Since tone is something so subjective to opinion, there is no perfect distortion box. There are just good ones, OK ones, and truly no-so-good ones. This also means that whatever I’m talking about here is a matter of personal opinion based on my own experiences and what I’ve learned from others. In other words, this might all ring true to you, while it might also ring like true crap. It’s up to you to decide. What makes a good distortion pedal, umm, good? Instead of focusing on specific models (although I will mention some favorites below) let’s just point out some of the qualities of a good distortion pedal. Overtones – A good distortion pedal should sound rich and maintain all the overtones the guitar and amp are producing. You don’t want a tinny, raspy or thin sound. When you start getting that ugly tinny, raspy sound it’s exactly when the distortion becomes unpleasant. Versatile – A good distortion pedal should work well with various guitars and amps. While there are dedicated metal pedals, or bluesy overdrive pedals, a good effects unit should be able to cover a wide gamut of music styles. Reliable – This one should be full of common sense but there are actually some crappy, unreliable units out there. You don’t want a pedal that spazzes out mid-solo! Fulltone OCD – Yep! Fulltone! I love those things. Right now, I have a version 4 OCD on my board. It sits right before my other favorite pedal, the Ibanez TS-808. What I really like about it is the fact that I can easily tune it to my mood. I usually run it really gritty, with the HP switch on. Every once in a while, a less dirty overdriven tone is required and that’s when the LP switch comes into play. This pedal has great range and it works really well when paired with an already overdriven amp. I own a Mesa Boogie Lonestar that is well known for awesome cleans yet less than stellar grit, but paired with the OCD it becomes quite satisfying. 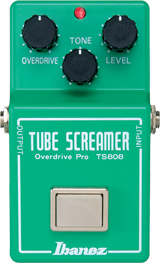 Ibanez TS-808 Tube Screamer – Now, I know what you are thinking, the Ibanez TS808 is not a distortion pedal. So why is it here? Well, it’s an overdrive pedal that doesn’t go very high into the realms of big distortion, but man does it sound awesome when paired with an already overdriven or distorted amp! This pedal is great for boosting a signal into higher overdrive. Got an amp that’s not delivering the output you want? Stick one of these in the signal chain and boost up the level passed 12 O’clock to really squeeze some juice out of it! Oh, and it does great as a dedicated overdrive on it’s very own too! Keeley Electronics Modded ProCo Rat – Last thing I heard, Robert Keeley wasn’t offering these for sale anymore, but the company is still modifying them for customers. There are many variations of this pedal and the nod goes to the older ones being better. Anyway, the point is the pedal is great. Stock, it’s Ok. But modded, the pedal actually becomes usable. The versatility of it increases tenfold and it sounds like it should! If you want one, the best thing you can do is hunt down an older model (at the very least try and find one with a serial number below 300,000) and send it over to Keeley to have it modded for around $65.00. 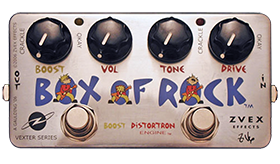 ZVex Box of Rock – I haven’t owned one of these, but I played with a guy that runs a Les Paul through one of those into a Marshall JCM. I thought the pedal was awesome and it’s next on my HAVE TO BUY list. Can’t comment too much on this one based on details and hands-on use, but I can comment on the sound… It rocks! Let’s just say, it sounds LOUD in a very good way. Great boost too. If you are serious about distortion, this is one pedal you don’t want to miss. Keep in mind these are all hand-made and hand-painted. This means, some look a little different! DigiTech Hardwire SC-2 Valve Distortion – DigiTech is quite a known brand that has been at it for a long time. They make excellent pedals, however, when it comes to being at the top of the list as a “best pedal” in any category people seem to go elsewhere. When it comes to the Hardwire line, I truly believe they hit the nail on the head, hard! This particular pedal, the SC-2 Valve Distortion, is a great sounding box. I admit I really like the entire Hardwire line for being rock-solid great performers. Like the other Hardwire pedals, the SC-2 features a relay driven true-bypass. These pedals are truly reliable and have some nice features that other pedals don’t. I say: winner! 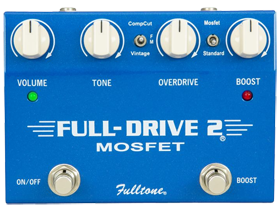 Fulltone Full-Drive 2 MOSFET – What, Fulltone again? Yes, again! Here’s a pedal that deserves 5 Stars, in a row! Plus, I really like pedals with two buttons. Two buttons usually means more features. In this case, the switch on the left turns the effect on and off. The switch on the right is a boost option with it’s own distortion control. This pedal is quite well known for being transparent. In other words, it does what it has to do without coloring your tone. Some say it’s a Tubescreamer clone with added features. But a good Tubescreamer clone at that! I don’t know about the clone part, but either way, it’s awesome! Xotic BB Preamp – This is the pedal some many guitarists first think about when they think of versatility. 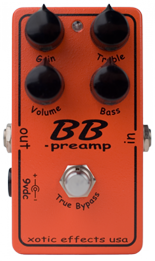 The BB Preamp can do stuff like simply be a clean boost (hard for many pedals) to then overdrive the crap out of the signal. Like the TS808, it’s not the typical distortion pedal per se, but what it can do is astonishing. In reality, it is a distortion and sustain pedal that allows for one of the best lead guitar tones out there. Oh,oh! I said best. But really, it’s awesome. I said it before and I’ll say it again… There’s is no “Best Distortion Pedal.” Tone is too much of an opinion to label a pedal as the BEST. In fact, there are some pedals out there that are labelled by many as absolute crap. Yet, you’ll can be 100% sure that you’ll be able to find somebody that loves it to death. However, as much as an opinion as tone is, there are certain things guitarists can agree on. For that very reason is that some pedals have become legends. It’s because enough guitarists consider a given pedal, the best. Multiply that by a lot, and you get a bunch of the best guitar distortion pedals! I often get a barrage of emails in relation to this article. The emails are usually asking me where to best buy one of these distortion pedals. I’ll make it easy for you. There’s one online retailer that has almost every single guitar effects pedal mentioned in this page. That’s Musician’s Friend, and their entire list of distortion pedals is here. If you are wondering why I said “almost” that’s because as of right now, they don’t sell the Xotic BB Preamp.